Tuesday businessman Alvaro Noboa thanked his militancy for having supported his party Adelante Ecuatoriano Adelante (AEA) with the collection of more than 186 thousand signatures in order for the National Electoral Council (CNE) to register it for the elections of 2017. “Today is a day of joy for me after achieving the registration … I hope that this continues to be the great party of Ecuador with which we won in 2006,” said the businessman, referring to the extint Prian. 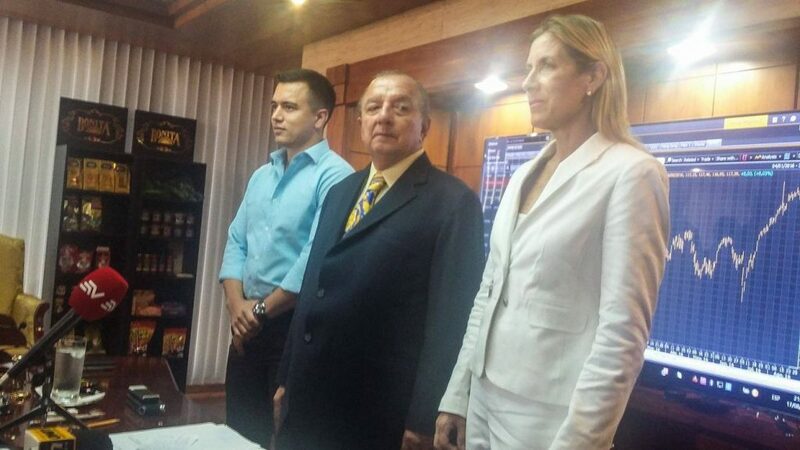 His wife, Anabella Azin, stressed that the CNE granted the same number of the previous party, since the followers of Noboa identify him the List 7. The businessman insisted on the idea that there must be two candidates for the coming elections, one for the “continuity” and another for the “renovation,” who would would be the convergence of the different trends that seek a change in the management of the government and thus overcome the economic crisis. She added that the trends must be “open and inclusive;” “If we all want the same, and we have the same thinking, why are we so separated? Those who have thoughts in common must come together,” she said. Noboa agreed and said that if the leaders of the other trends “leave their vanity,” it will be possible to choose a binomial after a consensus.